Truck Festival announces the much-anticipated Sunday headliner festival closing slot is *drum roll…* Mancunian indie legends Courteeners! The festival has also added another wave of brilliant talent for this year’s weekend including Editors who are playing the festival for the first time since their iconic performance in The Barn back in 2005. Drenge, Pins, Bad Sounds, Milk Teeth, Lewis Capaldi, Fickle Friends, King No-One, Doe, Yowl, Hey Charlie, Hellions, Orchards and itoldyouiwouldeatyou have also been added to the bill. The festival has also announced its cabaret and entertainment tent - The Rockin’ Chair - will be back for 2018. The venue was introduced last year as a home for live music, comedy and cabaret and will this year be hosted by cabaret comedian Wayne Carter. Entertaining from noon to the early hours will also be sets from: Big Beat Manifesto, Rhythm of The 90s, Massaoke, Old Dirty Brasstards, Mr B The Gentleman Rhymer, Horn Division, The Oxford Commas and Blue Rinse DJs. 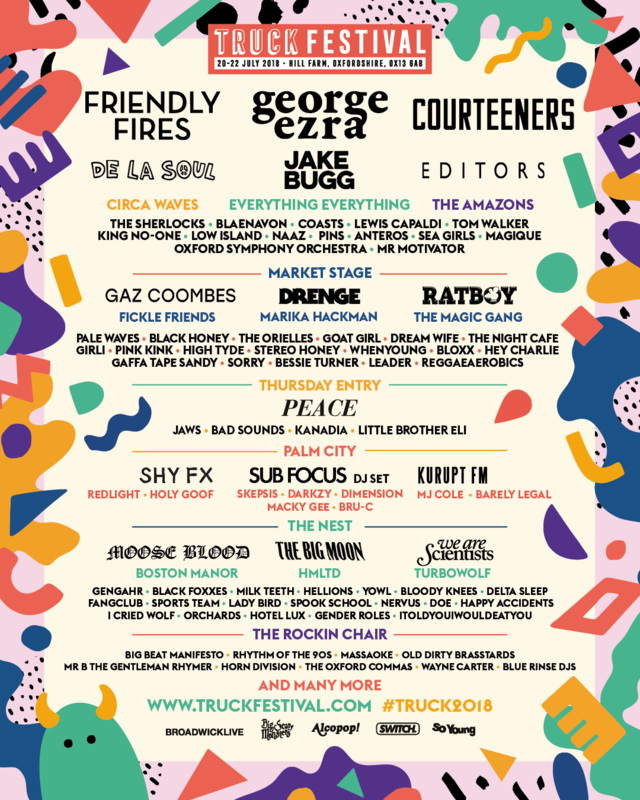 “We’re incredibly excited to finally share our second wave of artists for Truck Festival 2018! Indie cult heroes Courteeners will help close out the weekend which will no doubt result in the most raucous crowd Truck Festival has ever experienced. I can’t wait for Editors to play the Sunday sunset slot as we've been trying to get them to return for years since I witnessed them play my favourite set of 2005 in The Barn. Drenge will give the crowd everything making as much noise as possible as they make their Truck debut this year, closing the Market Stage on Saturday night. It's a must see for me! But it’s not all about the main stages, and we are glad to welcome back The Rockin' Chair for the second year! With the likes of live mass karaoke band Massaoke, Rhythm of the 90s and the Oxford Commas, it’s guaranteed to be the heart of the party! The festival, which formed in 1998, will take place from 19th – 22nd July at Hill Farm in Steventon, Oxfordshire. 2018 will be the first time ever that the festival has opened its doors on the Thursday with the festival taking place over four days this year and celebrating its 21st birthday! The rest of the bill is also features Friday headliner Friendly Fires and four-time Brit nominated and multi million selling singer-songwriter George Ezra on Saturday, as well as featuring the likes of Peace, De La Soul, Jake Bugg, Everything Everything, The Amazons, We Are Scientists, Pale Waves, Fickle Friends, Marika Hackman, Rat Boy and many more. Bloody Knees, The Spook School, Gaffa Tape Sandy, Fang Club, Sorry, Sports Team, Lady Bird, Seagirls, Delta Sleep, Nervus, Doe, Orchards, Happy Accidents, Bessie Turner, Gender Roles, Hotel Lux, Magique, itoldyouiwouldeatyou, Leader, Kanadia, Little Brother Eli, I Cried Wolf, DJ Elban, Mr Motivator, Reggae Aerobics, Oxford Symphony Orchestra. Weekend ticket prices are £110. Thursday add on passes are £25.